We’re teaming up with Jonkanoo Caribbean Canteen for a brand new Thursday night party! 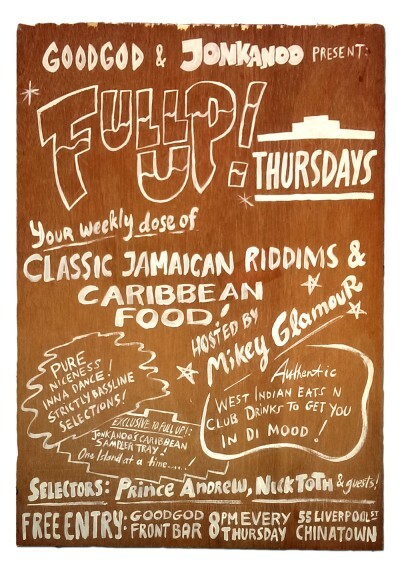 Full Up is gonna turn our Front Bar into an oldtime Jamaican basement party, with Mikey Glamour hosting an all-star cast of DJs including Nick Toth, Prince Andrew and Jimmy Sing for a night of classic riddims and bassline selections. Jonkanoo are also serving up their delicious Sampler Trays, featuring incredible eats from a different Caribbean island each week. They’re exclusive to Thursdays and only around for one night each, so make sure you check them out!